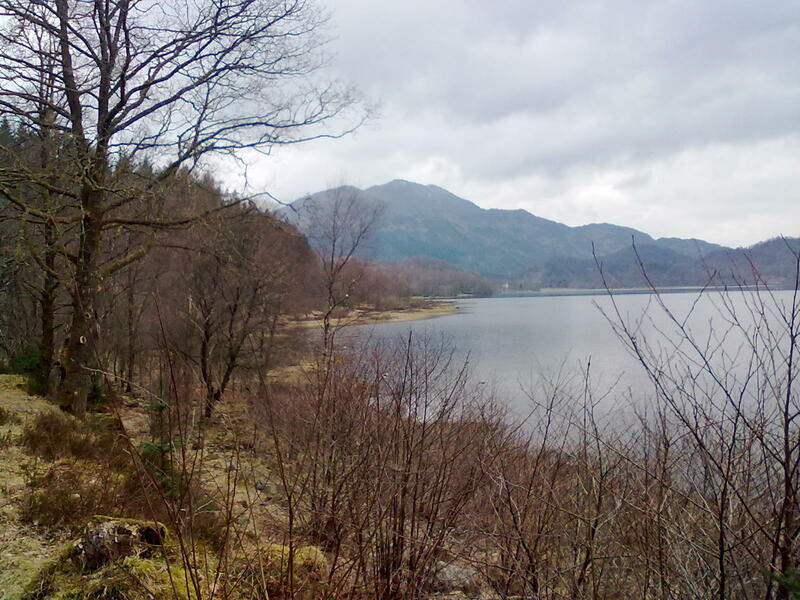 A circular route that takes in the taller peaks of the Trossachs - Ben Ledi and Ben Venue. Although fairly modest in height, the summit of the latter is a dramatic place to be, seemingly surrounded by lochs and gnarly hills. As well as the drama of running along exposed hilltops, there's also plenty more sheltered running along the shores of lochs or in forest trails, but never boring, I promise! I started today's adventure from the small carpark just a short distance down the A821 from Kilmahog. Cloud cloaked the upper hillsides, but at least it wasn't raining, and the air was still and peaceful, so much so that the lochs were like glass throughout the day. I descended onto the Callendar-Killin cyclepath (one of my favourite marathon-training runs) and headed into the native woodland at the start of the Pass of Leny, a gorgeous place to start out on a run. Unfortunately I wasn't at my best today, with recent racing in the legs (Deeside 33 and Barcelona Marathon), but it didn't detract from the journey. I finally got to base of the manicured trail up Ben Ledi, and bounded up it with dumb enthusiasm, especially as I have never been up Ben Ledi before! Ridiculous, really, given its proximity to home and how much more interesting it is to many a Munro further afield. I doubt I'm the only one guilty of generally over-looking the Trossachs, I admit it did feel a bit like a theme-park in places today but still. So yes I passed about 50 walkers on my ascent, and enjoyed a really good work-out (race-tired legs are much more capable of making you gasp for oxygen on a steep hillside!). The manicured path stops about half-way up but its all very runnable. From the top I got glimpses back through the cloud to Loch Lubnaig down on one side and Loch Venachar down the other. 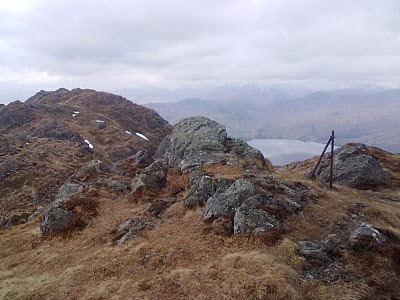 I continued beyond the trig-point along the summit some distance before striking W onto open hillside and down steepening terrain, picking up a fence-line and taking it fairly easy to avoid leaving my ankle behind in the scree. Followed the course of a burn between crags then hit leggy heather for a bit before reaching the farm track that descends Glen Clasig down to Glen Finglas Reservior and the twisty tarmac road down to Brig o Turk. My battered legs preferred the hillside. Now there's a great wee pub down here called the Byre Inn, and as I went in to get a pint of Orange and Lemonade, I nearly got something else instead and the appeal of running for the rest of the day had stiff competition. The pub had the radio playing, some program discussing Marathon Training, and it didn't motivate me in the slightest. I continued down the track from here to meet the bikepath along the S. shore of Loch Achray, with the next target, Ben Venue, directly ahead and looking nice and craggy. This part of the trossachs is craggy, as craggy as much of the NW coast and better for it. 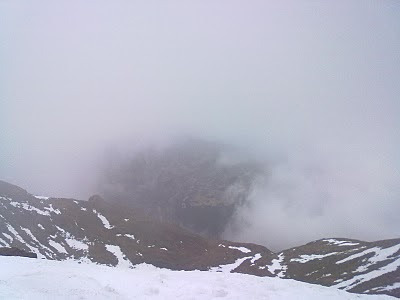 So time for another confession - I've never been up Ben Venue either. I hope I'm back again though. Picking up a small trail onto Dukes Pass road (A821) I missed any signs of a continuing trail (shown on the OS maps) that would take me onto the forest roads beyond, and ended up in a break-a-leg-style ex-forest, with holes hidden by dead wood hidden by grass, moss, and thorny stuff. Not clever, but it was only a couple hundred yards. 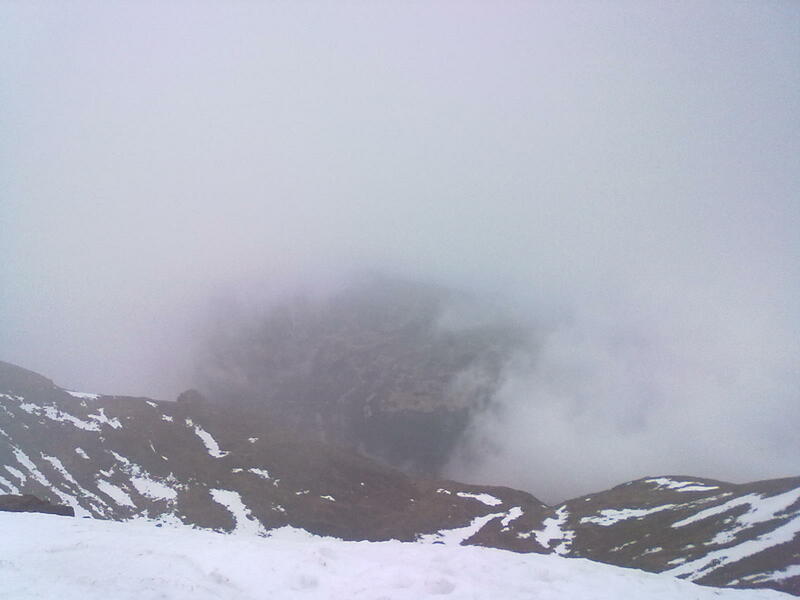 Eventually I joined the main tourist traffic up through the forest and out into the corrie. Filled the bladder from a stream here and emptied the other bladder away from the stream, then almost running on all fours up by the waterfall to get onto the ridge and another world opened up. Wow! Arrochar alps, Ben Lomond, the Tyndrum summits of Ben Oss, Lui and Dubhcraig, with mirror-like lochs below. The rest of way to the summits of Ben Venue follows a path that picks its way through the rocky terrain, great fun to run but needed to pay attention and wait till I got to the cairn before taking in the views for proper (main photo). From the top I backtracked W then SW along the ridge, beyond where I ascended to a bealach then after a short amount of ascent started cutting S to pick up a landy track curving steeply back up onto a ridge with a funny hut on it. Now facing SW, the scene ahead was quite a contrast to just 20 minutes before, as I found myself looking over grassy rolling hillsides back towards the central lowlands. As I followed the trail gently downards I found myself totally surrounded by 10s, perhaps 100s of deer. They were running, of course, sometimes right across the track in front of me. The track does some hefty zig-zags down the very steep hillside, it was here I noticed the first of several signs indicating "Exit Route to Aberfoyle" with an arrow, so I obliged. This would avoid me having to run along the narrow, potentially busy road at the bottom. An arrow pointed me off the track towards larch forest, into which a trail half-heartedly entered then disappeared beneath the fallen needles. I perservered for another 20 or so yards, over a burn and onto a steep firebreak, then decided the best thing was just to descend this. Sure enough, I found another "Exit Route" sign at the bottom. With roof-tops not too far below, I made my way down steep oak woodland to the road, and picked up a road-side path into Aberfoyle. The fatigue hit as I entered Aberfoyle - actually it was probably more dehydration. I felt like a right muppet with my mud-caked legs standing there filling a hydration bladder in the middle of a busy tourist town. 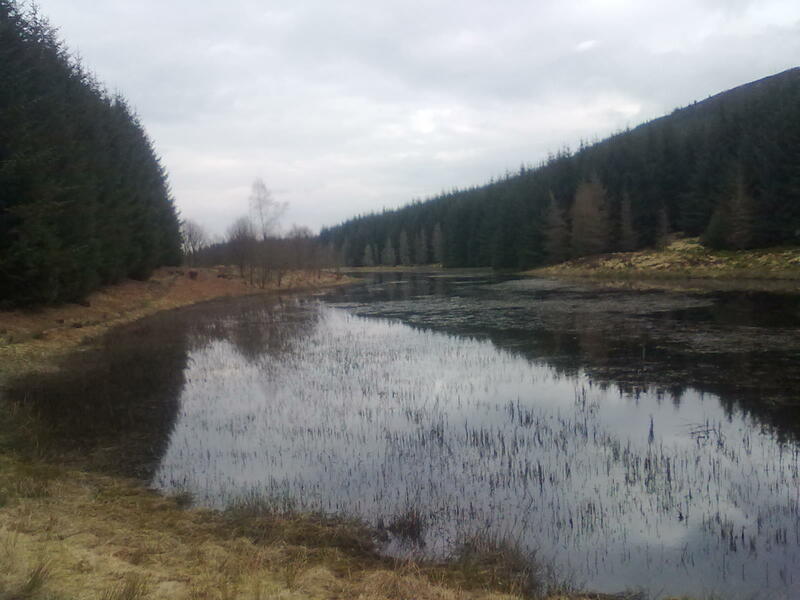 The onward route follows the Rob Roy Way back towards Calander - first by following a path from the town's main carpark then back out to cross over the main road on the E side of town and pick up a forest road behind the golf-course. That was the most boring part - thankfully it did get better again as the road was replaced by singletrack, then out onto wild grassland, then another mirror-like Lochan. Beyond the Lochan it time for more trees, but with plenty views over Loch Venechar to Ben Ledi bringing back memories of the morning. The quiet loch-side road (cycle route) was joined, before taking a left at the end of the Loch to pick up the A821 back to the car.